After I first heard about the format of the Saga Iron Man tournament, I was determined to enter the next one that was relatively local to me – so I was very happy when Battlefield Hobbies (almost my FLGS) announced a tournament. If you are not aware, a Saga Iron Man tournament is slightly different to the usual UK Saga tournaments. Rather than turning up with your ready prepared army, you actually turn up with very little. Instead, you play a number of games with armies that are given to you. It’s very much a case of learning how your warband works ‘on the fly’. The even I attended ended up being slightly reduced in size due to a couple of last minute drop-outs, which left 6 of us to battle it out to see who was the ‘Saga Iron Man’. Each Warband is made up of 1 Warlord, 2 Hearthguard Units, 3 Warrior Units and 1 Levy Unit. Games last for 6 turns. The idea of the game is to kill as many of your opponents warband as you can – the game does not finish if you kill your opponent’s Warlord. Highest score at the end of the tournament wins – simple as that. You randomly decide your first warband at the start of the day, and then work round the tables. Game #1 was Welsh vs Anglo-Saxons. I had drawn the Welsh – not a faction I was at all familiar with. I was playing Lee, who was a Saga newbie, so the first thing was to teach him how to play the game. Though I hadn’t played myself in almost a year, luckily the last time I played, I had run several games at Joy of Six, so it soon came flooding back. I can’t have been that bad a teacher, as Jamie ended up defeating me – a very bloody encounter ended with my Warlord cut down in single combat, and Lee’s own warlord leading a charmed life. Game #2 saw me playing Strathclyde Welsh against Norse Gaels. I think it’s fair to say that my young opponent Jack struggled to play his army, whilst I discovered just how nasty Strathclyde Welsh can be with their abilities that are fuelled by keeping a couple of units off the table. 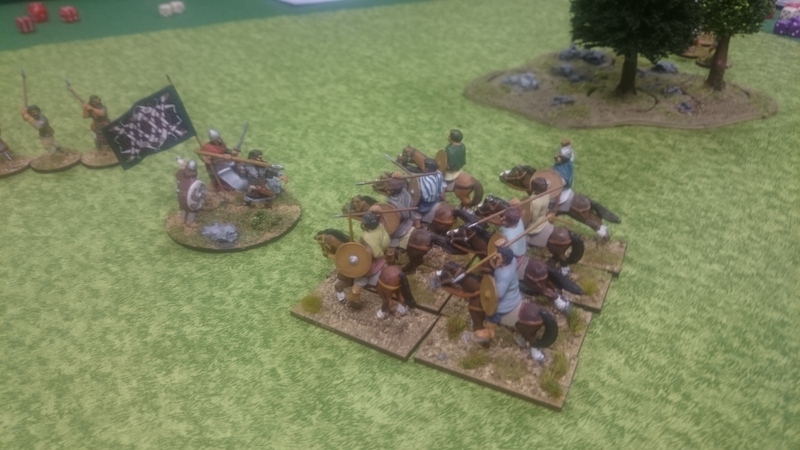 This game, even more than the last, showed the difficulty of a warband on foot dealing with a mobile mounted opponent – and unfortunately hints and coaching of my opponent didn’t seem to help (“Do you really want to do that? Because if you do that, I can then do this…”). Whilst Jack managed to kill a goodly number of my troops, he never recovered from the loss of his Warlord in the middle of the game. I won, but felt a real heel in doing so. Game #3 saw me playing Rus Princes against Steppe Tribes, with the Steppe Tribes being run by Steve (funnily enough, Jack’s dad). I really struggled to get my head around the Rus Warband’s abilities, whilst the Steppe Tribes quickly turned out to be a nasty opponent. I think the only reason that I won was that, following my own experience playing Normans, I kept my mounted Hearthguard together as a single unit and used them as a battering ram with my mounted Warlord. It was another bloody fight, again pretty much resolved by the death of my opponents Warlord, though in the end neither of us had many models left on the table. Come the end of the day, I was more than a little shocked to discover that I had won! Lee was second and Steve, third. It was a great day of gaming with a very friendly bunch of fellow players, and a wonderful and challenging format in which to play Saga. Huge thanks to Richard Keenan for running the day – he provides all the models (which, by the way, all look great and are painted by Richard himself), dice, battleboards etc. as part of the service, all you need to do is turn up. I’d highly recommend you trying this format of Saga if you get the opportunity. The ultimate winner on the day was Saga itself, as almost everyone ended up buying new factions to try – I was very tempted to get a plastic box set of Arab infantry so that I can complete my Saracen force, although a couple of boxes of Mounted Mongol Archers from Fireforge would pretty much complete a Steppe Tribes army, who seem a very nasty warband.